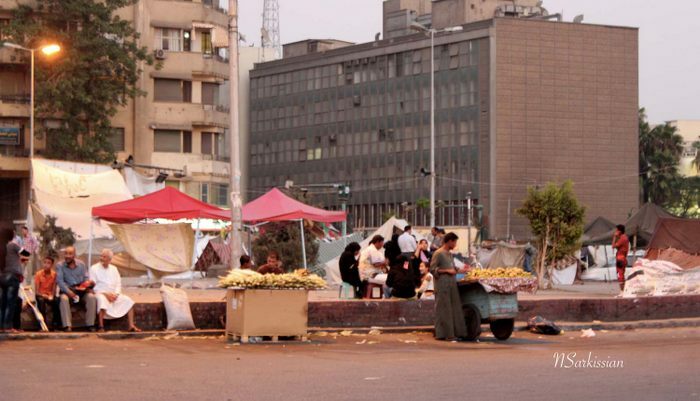 Tahrir Square has undergone many changes since last summer when I was there (See Tahrir Square, August 2011). Now, where tanks once sat presiding, flags fly. 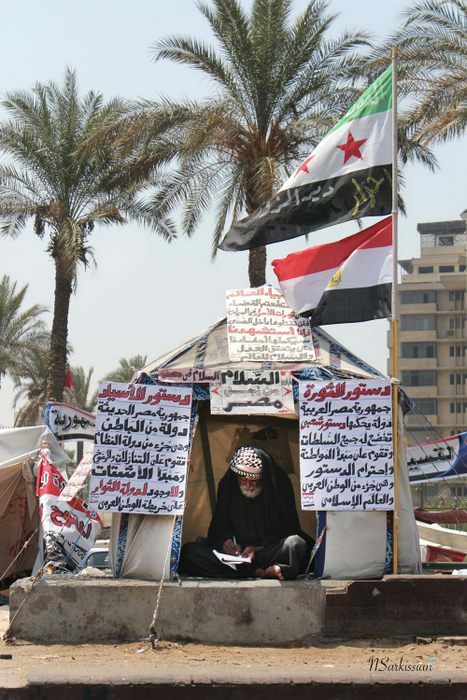 Where military police crouched behind plexiglass shields, squatters in tents decorated with political slogans now crowd together on dusty traffic circles. 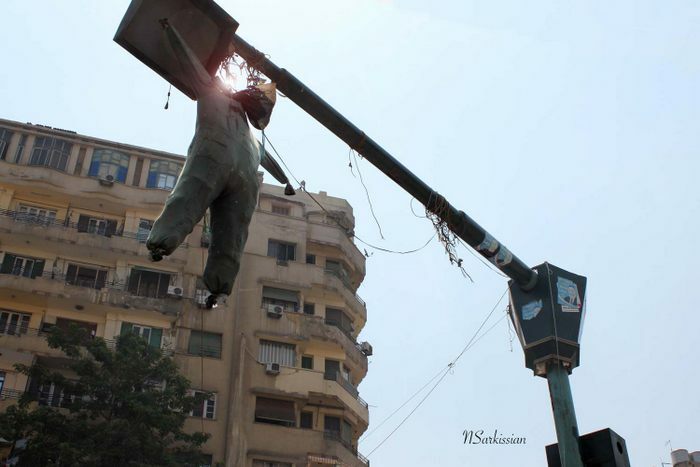 Overhead, a stuffed effigy of Hosni Mubarak dangles from a streetlight. 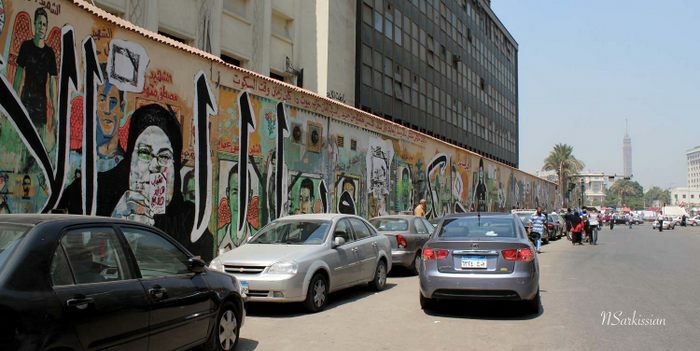 And along Mohamed Mahmoud Street, which connects Tahrir Square to the Interior Ministry and flanks the American University of Cairo campus, graffiti murals have sprung up. 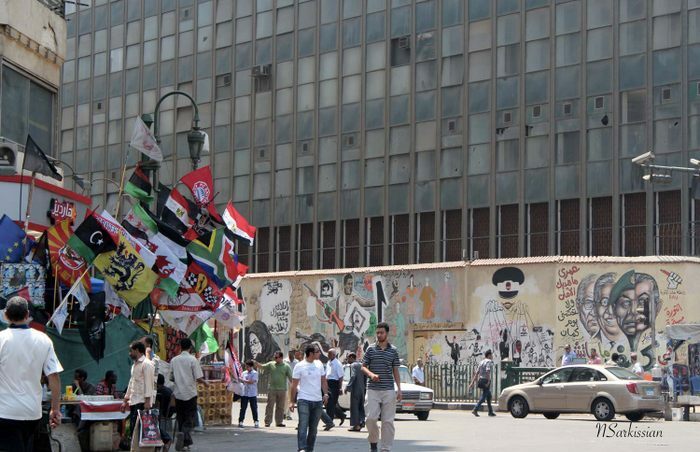 The place where many deadly confrontations between protestors and police unfolded in recent months, Mohamed Mahmoud Street has emerged as a memorial that documents different moments in the on-going political events in Egypt. 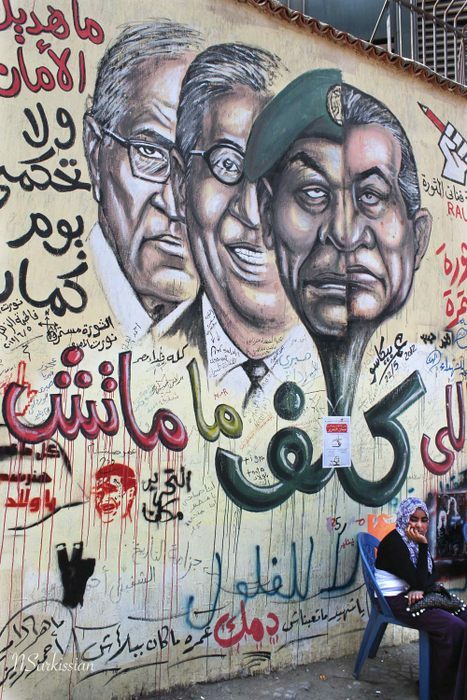 The Egyptian artists responsible for these paintings flocked to the walls when some of the worst clashes were unfolding in the fall of 2011; their ranks swelled after the Port Said massacre of February 1, 2012. They arrived with no preconceived message but with the idea that art was a weapon at the service of change. They began to collect images and paint them while witnessing the events and listening to stories recounted by the many onlookers who came to offer their support and protection against the police. This is the case, for example, with a verse from the Qu’ran which appeared. 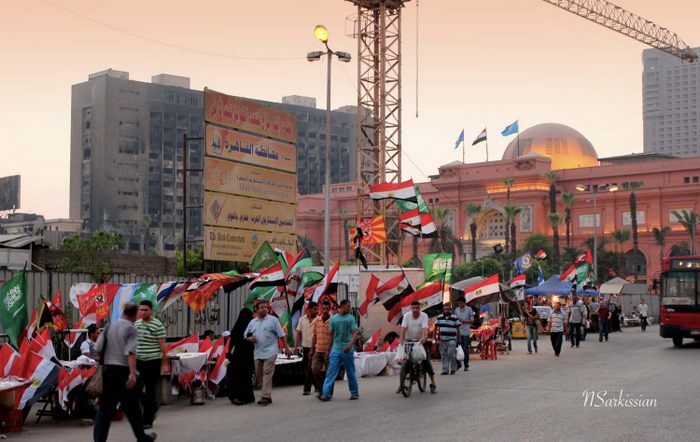 Referring to doomsday, the inscription (when people are held accountable, they will say they’ve been following their leaders) was painted after a citizen was heard citing the verse to one of the Muslim Brotherhood representatives. 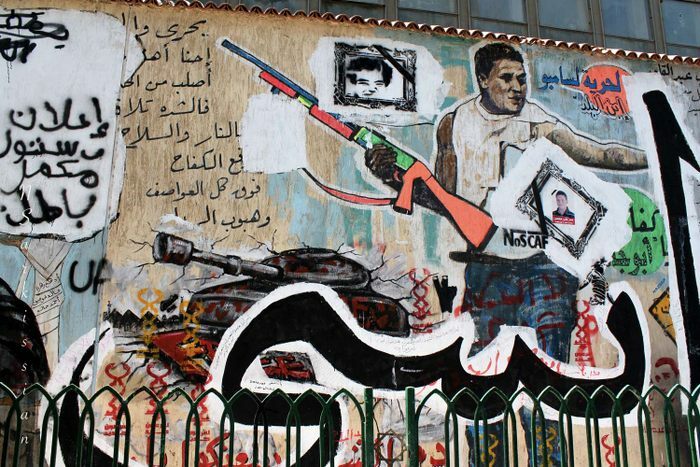 (From the American University of Cairo Lecture and Panel Discussion, Visualizing the Revolution: Epic Murals of Tahrir Square). 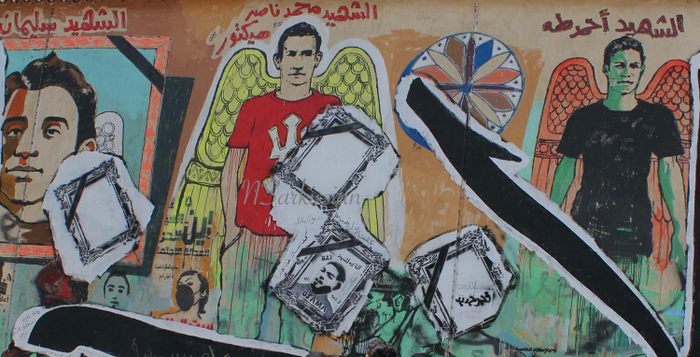 Other images include likenesses of martyrs of the Revolution including Al Ahly Ultras (who were—it is claimed—punished by the police because they had offered support to Tahrir Square revolutionaries in the early days of the Arab Spring) as well as beautiful Pharaonic-like scenes. 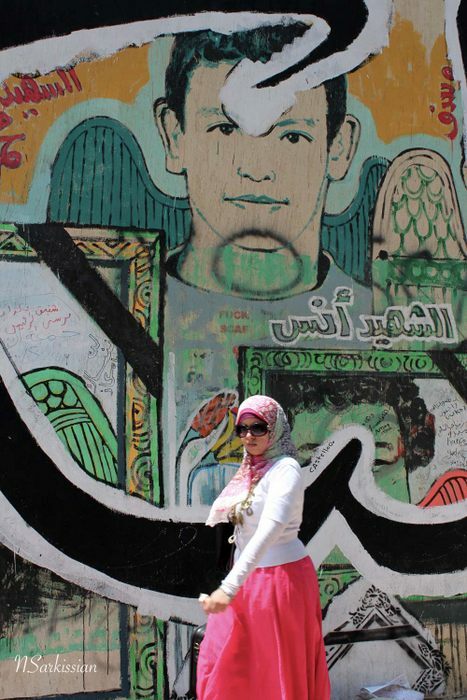 In the months since the murals first appeared, they have continued to change, in some cases painted over by authorities. 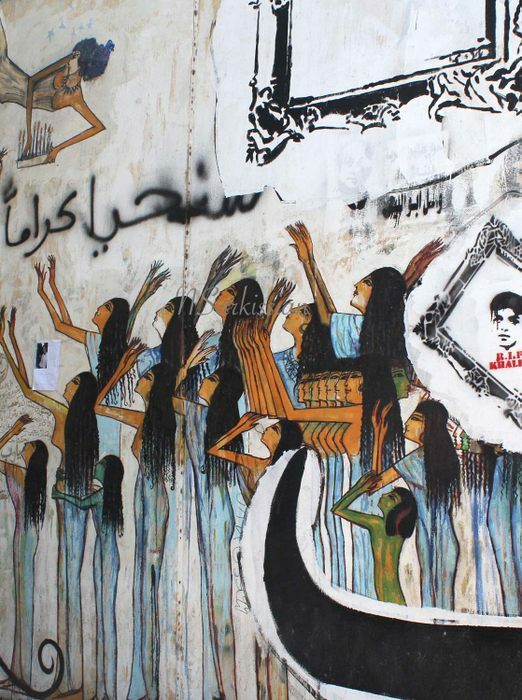 Although the American University of Cairo has attempted to save the murals from destruction, the artists feel such protection is useless if the freedom of human beings is constantly curtailed. Graffiti murals, they say, must continue to be a response to new events and must change necessarily. 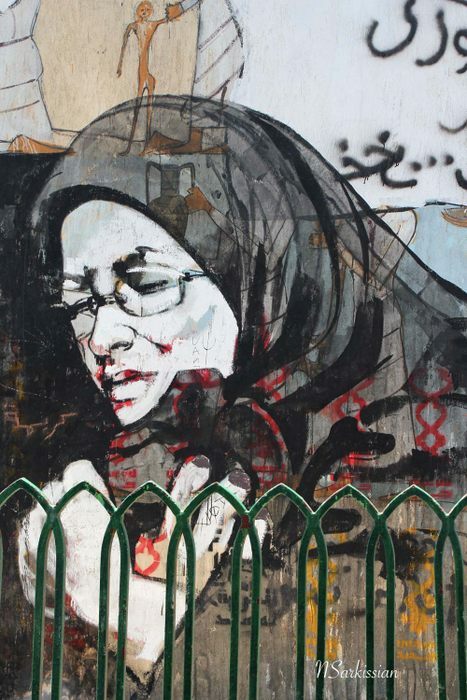 It is not surprising then to learn that the artists themselves have recently defaced their own work, painting the words “forget what has happened, focus on the elections,” together with portraits of the mothers of martyrs over previous layers of revolutionary history. Such riveting photos! I especially love the way there seems to be a halo hovering above the young lady’s head in “Girl and Martyr.” Nor can I stop looking at Martyr–the translucent figure with all that life going on around, behind and inside her. Thanks so very much for sharing these. I hope you’re well, friend. Hi Jen, glad you liked the photos. Great to hear from you! 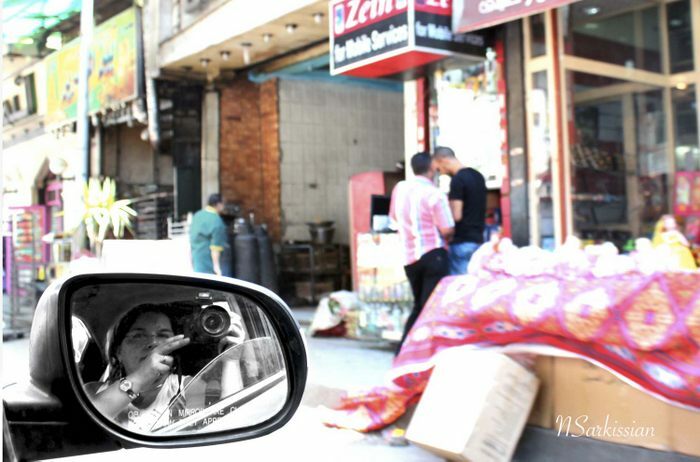 Natalia, thank you so much for sharing these images! it’s wonderful to see them — striking, sad, beautiful, strong. The Pharaonic figures amazed and moved me. There’s just nowhere else my partner and I could see anything like this! We’ve both spent time looking through them, repeatedly. Thanks Cynthia! The Pharaonic images are by Alaa Awad who teaches at the Luxor Fine Arts College. Here’s a link to an interview/article in Artforum about him. Thanks for sharing the art of survival and freedom with us. Our news services don’t show these images. Beebee, only too happy to oblige. I admired these and wanted others to be able to see them.